Clean gutters and downspouts. Blocked gutters may cause roof water to pour directly into a home’s foundation, increasing the risk of basement flooding. Any debris, such as leaves or branches should be removed from the gutters. The gutters should be checked for loose particles if the roofing is made of asphalt. Moreover, loose gutter straps and spout extensions must be tightened. If there is gunk in the downspouts, they can be cleaned by pouring water into the downspouts with a garden hose. Extend downspouts. To protect a basement from excess water, downspouts should extend at least 1.5 metres away from the house. This can be achieved by adding plastic or metal extensions to the downspouts. For extra protection against basement flooding, an underground drain pipe can be installed. This system sends gutter run-off away from the house. Slope the ground away from the foundation. The ground next to your foundation must slope away from the foundation to divert rainwater away from the home. The “crown” of dirt around the house should slope at least 15 centimetres over the first 3 metres in all directions. Seal gaps in the basement. Water may leak into the basement through gaps or cracks around plumbing pipes or cracks in concrete walls. These gaps should be sealed with polyurethane caulk or hydraulic cement. However, if water comes through the floor, sealing gaps won’t do the trick and the groundwater problem will need to be fixed. Install a French drain. For serious water problems, installing a curtain drain such as a French drain is recommended. This type of drainage system consists of a series of underground pipes that diverts water away from the home’s foundation. Waterproof interior basement walls. 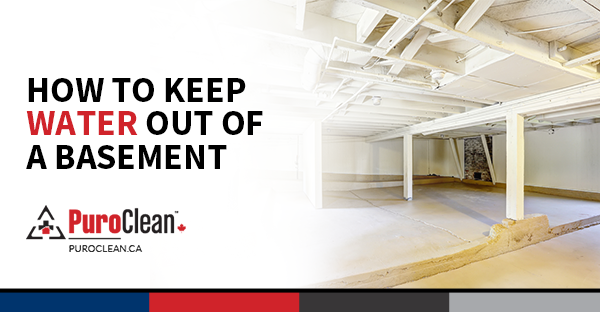 Condensation that forms on basement walls may be prevented by applying sealant on the walls. The basement walls can be waterproofed with concrete coatings, silicate-based concrete sealers, waterproofing paint or plastic sheets or panels. Install a sump pump. These devices provide protection against flooding by pumping out water that has accumulated in the sump basin. When the water level in the basement floor rises, the sump pump will automatically discharge the water outside the house. Here’s how to choose a sump pump and how to test a sump pump. In case of a flooded basement, a water damage contractor must be contacted immediately. To avoid safety hazards, property owners should avoid entering the basement and make sure to not make direct contact with floodwater. The PuroClean team stands ready to provide professional restoration services to any property affected by fire, water or mould damage.